I just purchased the above Bachman Track Pack but can't seem to set up the piers where they are supposed to go according to the photo on the box. The photo on the box shows a straight piece of track supported on piers on either side of the lower track. However, when I set it up the straight track connection on the upper piece is directly over the lower track and I can't put a pier directly under the connection. I have to slide it back on either side resulting in a situation of an unsupported connection that dips down when a train runs over it. Any ideas on what I'm doing wrong setting this up? It came with 19 pieces of 18" radius curved track and 1 piece of 18" radius curved section that has a terminal and rerailer on it. It also came with 4 9" straight pieces of track which I assume forms the "x" where the two circles come together with the over-under. you have a couple of options here. The setup you describe is going to have the track joint right over top of the other track. You are doing nothing wrong. Your first option is to find some way to support that track joint. You can try using a thin piece of wood or metal under the track for support. I'd try 1/8 inch plain moulding strips, available at lowes or home depot. You should be able to glue or otherwise fasten these to the bottom of your track if they're wide enough. But if the support structure is too thick it will interfere with the clearance over the track below, and some of your cars might not fit. Another option would be to buy a bridge to slip under the upper track between the bridge piers. The third and fourth options involve tweaking your track plan. option three is to replace one of the 9" straights with two 4 1/2" ones, placed either side of the remaining 9" straight on the upper track. By splitting the difference, you can ensure that your track joints will be well away from the lower track. Option 4 is to replace two straights with two 18" curves. Instead of having 1en curves on each side, with paired straights in the middle, you'll have eleven 18" curves on each side, with a single straight on each level connecting the curves. believe it or not, replacing the 2 straights with curves does not change the figure 8 pattern much. The only difference is that the upper track crosses the lower at a different angle. either that or you could place a 4 1/2 straight on either side of the bridge, which would move the bridge piers to where they can be of most use. 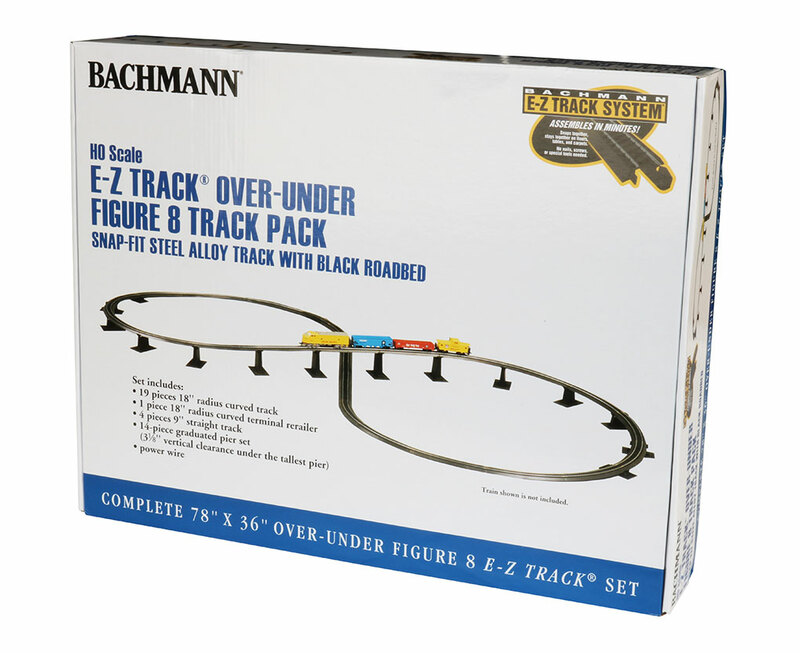 What's interesting is that the picture that Bachmann shows for the Steel Alloy E-Z TRACK® Over-Under Figure 8 Track Pack (HO Scale). This is off of Bachmann's product page. The picture shows that it has 6 straights but the list of track only indicates 4 straights are included. No, I don't think there are six straights in the photo. The piers are not under the track joints, just like the OP had stated. If you notice, the seven piers on each side of the figure 8 are spread out over just five track sections, four curves and one straight. Therefore they cannot be under the joints. What concerns me about the photo, though, is the steepness of the grade. 3.125" rise over 45" run (5 track sections of 9" apiece) is about a 6.8% grade, almost twice the recommended maximum. Spreading the piers to one per section will lower the grade to 4.9%, much better, but still steeper than the 4% recommended maximum. But at least 4.9% is workable, though it would cut your locomotive's pulling power down to about 10% of what it will pull on level track. Please help. Now, I am confused. I just did these in Anyrail. One is 20 -18" curves and 4 - 9" straights. The other is 20 -18" curves and 6 - 9" straights. What am I doing wrong? It's not matching up. ANyrail is a cad program. It is unfailingly exact, and does not account for the wiggle room between track sections we encounter in the real world. The problem you've encountered is something I've often seen when trying to duplicate published plans with anyrail. I have no doubt that if you used the ten curves and 4 straights you'd be able to get them to connect. It is worth noting that the 30degree 18r curves and the 9" straights are standard pieces among several manufacturers. So you can build the same plan in several different cad programs (scarm, anyrail, etc) using several different libraries (EZ track, atlas, power lock) with similar results. I know Bachmann has been selling these packs for years and people have been using them so they must fit together. The picture does show 6 straights, though, with the piers under the joints. On the bottom, you can clearly see the rail joiners on the three straights. In the picture of the full layout, you can count the 10 curved pieces on the right side of it. It has me befuddled now. With 6 straights, it should look like the bottom Anyrail diagram I did and there would be a lot of fudging to get that to line up. I don't know how they did it. I even tried adding combinations of 4.5", 3", 2.25", and 2" pieces and I couldn't get it to line up perfect in Anyrail. it's a mystery to me as well. According to anyrail it shouldn't work, even accounting for the wiggle room. That is a huge discrepancy. When using Bachmann E-Z Track, the geometry of the track used to build a track plan does not need to be exact to have a useable track plan. Example - The pieces needed in http://www.bachmanntrains.com/home-usa/board/index.php/topic,34084.msg251455.html#msg251455 track plan for exact fit to me are a waste of money.